Ananta Vrata, dedicated to Lord Vishnu, is observed on the 14th day of the bright fortnight of Bhadrapad month. It is believed that Lord Vishnu appeared on this day as Ananta padmanabha. Anantharoopi Viswathman Ananthaya Namo Namaha!! Ananta means the one who is all pervasive, who is eternal, who is beyond all boundaries and for whom there is no limit either by space, time or location. He is the one who has infinite number of forms and He dwells in the entire Universe. He is invincible and omnipresent. His glory is infinite. He is highly meritorious among the meritorious. No one can describe or define Him precisely. He is also popularly called as Padmanabha the one who has a Lotus like navel or the one who has Lotus in the navel. Anantha Padmanabha is none other than Lord Sri Maha Vishnu. Salutations to the Infinite, one who has manifested as innumerable number of forms, who has innumerable feet, eyes, heads, arms, one who has innumerable number of names, who is an eternal person, and who holds thousands of crores of Yugas which are uncountable. 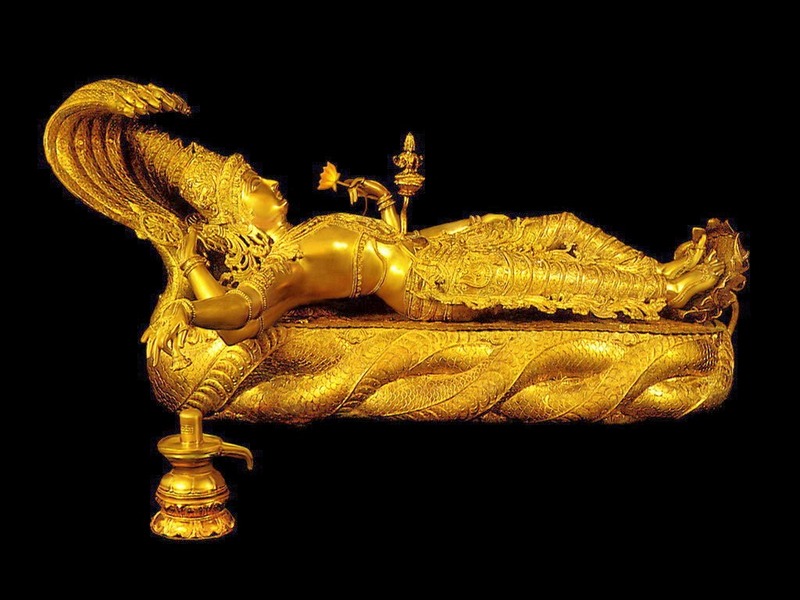 Above sloka is a dhyana sloka of Lord Sri Maha Vishnu that describes Him as the embodiment and personification of peace,one who reclines on the great serpent bed Aadisesha, one whose navel is in the form of a Lotus that has given birth to the creation of Universe, one who is the Lord of the Deities, on whose support entire Universe is rested, who is all pervading like the sky, one whose colour resembles that of a cloud, the one who has a beautiful and auspicious body configuration, one who is the Lord of Goddess Lakshmi Devi, one who has Lotus eyes, one who rests in the hearts of Yogis who perceive Him through meditation, He is the one who is the destroyer of fear of cycle of births and deaths (Samsara), and I adore Sri Maha Vishnu the Lord of entire Universe. Several austerities are prescribed to be performed in the name of Lord Sri Maha Vishnu in Hindu religion. One such prominent austerity performed that is dedicated to Lord Sri Maha Vishnu isSri Ananta Padmanabha Vratha. This vratha is performed every year on the 14th day (Chaturdasi) of bright fortnight (sukla paksha) in Bhadrapada Masam as per Hindu Lunar Calendar. Since it is performed on the Chaturdasi day it is popularly known asAnanta Chaturdasi. Chaturdasi day associated with Pournami thithi is preferred and considered as auspicious and sacred for performing this Vratha. In this vratha, Lord Sri Maha Vishnu is worshipped in the form of Ananta with shodasa upachaara pooja. Seven # Dharbha (Kusa grass) are tied together representing Lord Anantha with seven hoods. Goddess Yamuna Devi is also worshipped along with Lord Anantha on this day. In Anantha Padmanabha vratha there issignificance for # 14. It is performed on the 14th day in the Lunar Calendar. This vratha is performed for 14 years before it is concluded with Udyapana. Lord Vishnu is worshipped with 14 varieties of flowers, fruits and dishes. A special sweet dish made with wheat flour and jaggery is prepared in 28 # and half of it is given as charity to a Brahmin after Nivedana to Lord Ananta. Another significant feature in this vratha is worshipping Lord Anantha with a red coloured silk thread having 14 knots known asThora. On completion of the pooja this Thora is tied to the shoulder or wrist of the Grihastha. It is believed to act as a protection (Raksha) to the one who wears it. It is retained till next year and replaced with a new one at the time of Sri Ananta Padmanabha vratha. Both men and women participate in this vratha. As per scripts it is said that Lord Sri Krishna had narrated the significance of Sri Ananta Padmanabha Vratha to Dharmaraja. On the advice and direction of Lord Sri Krishna, Dharmaraja had performed this Vratha during their exile in forests. It is said that details of Ananta Padmanabha Vratha Kalpa are mentioned inBhavishyottara Purana. It is believed and said that those who perform this austerity as per the norms with total devotion and sincerity will be bestowed with multiple merits viz. Dharma, Artha, Kama and Moksha. Giving a Cow as a charity (Ghodana) on this day is considered as highly sacred and meritorious. We have number of temples especially in South India which are dedicated to Lord Sri Ananta Padmanabha. Prominent among them is the temple at Thiruvananthapuram (Trivandrum) in Kerala known as Ananta Sayanam. There is also an ancient temple dedicated to Lord Sri Anantha Padmanabha at Sri Kshethra Kudupunear Mangalore. It is said that this temple is in existence since Krita Yuga. Aslesha Bali pooja performed at this temple for Naga dosha is vey popular. It is a rare temple dedicated to Lord Sri Ananta Padmanabha. There is also another very ancient temple dedicated to Lord Ananta at Ananthagiri about 75 km from Hyderabad city. Here the Lord is said to have manifested as a Salagrama Shila who appears in Trimurti Swaroopa of Ananta, Narasimha and Srinivasa. It is said that Sage Markandeya had performed penance at this place. The three Ranganatha kshetras at Sri Rangam (Trichy), Srirangapatna (near Mysore) and Shivana Samudra (about 100 km from Bangalore near Mandya on the way to Mysore) all the three on the banks of sacred river Kaveri also have temples of Lord Maha Vishnu in reclining form resting on Ananta (Bhujaga sayana). On this auspicious day of Ananta Chaturdasi special celebrations are held at all those temples that are dedicated to Lord Sri Ananta Padmanabha. Reciting Sri Vishnu Sahasra Nama Sthothram, Purusha Sooktham, Sri Vishnu Sooktham on this day is considered as highly meritorious.